Rather be Elsewhere? Then escape to Elsewhere Retreat and enjoy a unique Blue Mountains experience in the magical Megalong Valley. *COMPLIMENTARY FIREWOOD, CHAMPAGNE, SATELLITE TV, WIFI INTERNET & ALL BED & BATH LINEN. SUNDAY LATE CHECKOUT - ANY TIME YOU LIKE all this and so much more. Elsewhere Retreat is a secluded haven on 40 acres with stunning views of rolling hills and escarpment in the magical Megalong Valley. It is supremely private with no other house or accommodation on the property or visible from anywhere on the property, yet only 20 minutes from Blackheath and all the attractions of the Blue Mountains. The house itself is graced with cathedral ceilings, picture windows, open fireplaces and all modern amenities, including furniture and fittings to the highest standard so that your comfort is guaranteed. There are breathtaking views from every window and wrap-around verandahs on all sides of the house from which you can gaze at the escarpment, or just follow the sun from East to West as the day unfolds. Explore the 40 acres and follow the meandering creek or sit and enjoy the view from the viewing seats above the house. Whether you grab one of our bikes to explore or choose to snooze in a hammock or rocking chair on the verandah, you cannot fail to be captivated by the magic of Elsewhere. All linen and firewood is provided and there is an extensive library of books, DVDs, CDs, videos, games and even mountain bikes. We pride ourselves on making Elsewhere your home away from home, trying to provide every little thing you would expect to have in your own home - which is why so many of our guests come back to stay again and again. Don't just take our word for it - read our guests' reviews. At Elsewhere, there is plenty to do or nothing to do..... the choice is yours. 4 BEDROOMS SLEEP 8 IN SUPREME COMFORT. The bedrooms are serviced by 2 bathrooms. The main bathroom has separate shower and bath and a separate toilet room too. The other is a 2-way en-suite that can be locked on 1 side and used by 1 bedroom or unlocked it can be used by 2 bedrooms. It includes toilet, shower and vanity. Hair dryers and toiletries (soap, bath gel & body lotion) are provided. *Totem tennis, shuttlecock, Boules and more. *European cast iron pots and pans. There is also a large laundry with washing machine, dryer, ironing board and a covered clothesline. In case of emergencies we even have a back-up generator as well as a first-aid kit. Please note that there is a fishpond at Elsewhere and so children must be supervised and responsibility taken for their safety around the pond (and the creek too). 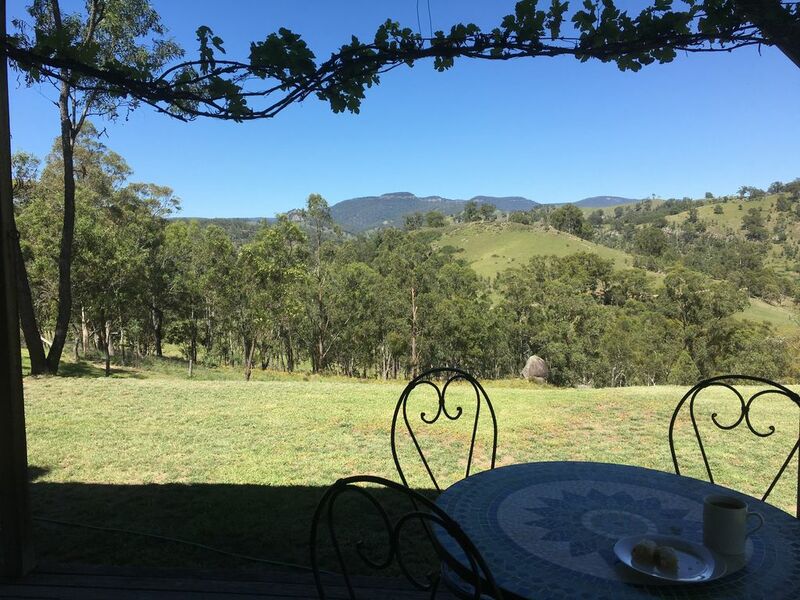 Elsewhere Retreat in the Megalong Valley is less than 2 hours drive from Sydney and is reached via a magnificent rainforest descent from Blackheath. Its location offers the perfect balance of proximity to the many attractions of the acclaimed Blue Mountains but with the advantage of blissful solitude, no prying neighbours or other guests, magnificent views and the chance to see our wonderful fauna at close range. Weekend rates start at $1200 for up to 4 guests and go to $1800 for a full house of 8 guests. Arrival is from 3.00pm on Friday and departure anytime on Sunday. Weekly rates go from Friday to Friday or Monday to Monday and start at $2400 for 4 people. For your added security, this property "Elsewhere Retreat" is only managed in Australia and we never request payments be made to overseas bank accounts. Elsewhere has the perfect layout for guests with bedrooms all down one end of the house with a door to the large open plan living/dining area. Then there is the view and the peace and quiet! Just sublime... The light changes throughout the day, the birdlife provides constant entertainment and it is just so magical! Words do not do it justice. One guest wrote in our visitors book that she had finally found Utopia.... and that says it all! The ensuite bathroom contains a shower, toilet and vanity and can be locked on 1 side to service just the master bedroom or used to service 2 bedrooms as required. The main bathroom has a shower and separate bath as well as vanity and toilet. Stereo and ipod jack available. level lawn area around the house with rose, herb and native gardens. This is a lovely property - perfect for families and dog lovers. Kind hosts Louise and Andrew ensured we felt welcome at their hideaway among the rolling hills of the Megalong Valley. Perfect for our group of six, we had a very relaxing weekend surrounded by natural beauty with all the comforts of home. It was hot and the electricity did go down, but it was still great. We are so pleased that you enjoyed your return stay despite the storm taking out the power in the Valley.. I hope you made use of our generator while the power was out. An incredible place, everywhere you look from the amazing house is just hills and grass and scenic. Andrew and Louise were incredible guests to make the stay even better. Our dog ran straight the ohhh the Flyscreen and they were so accommodating and reassuring with the event. Thanks for the review Alexandra and thank you for communicating with us immediately the dog ran through the fly screen ... it was thoughtful of you. Amazing property well away from the hustle and bustle of the city. We adored our time at Elsewhere. The property is amazing and more importantly Andrew and Louise were the most wonderul hosts, we thank them for all their care!! Would highly recommend an adventure to Elsewhere to nourish the soul! Great Stay In the Aussie Bush! We had a wonderful stay away from the city lights - encountering black snakes, rabbits, kangaroos, cows, frogs and horses! Our 9yr old and 11yr old children loved being out in the bush for the 2 days - and in particular our Kelpie dog - who thought all of his Christmas's had come at once - being so free and roaming the mountain side! Thankyou so much Louise and Andrew for allowing us to stay at your wonderful property. The house was clean, comfortable and brought big smiles to our children's faces when they were able to roast marsh mellows on the fire...it's the simple things in life! What a fabulous couple of days away from technology! Thankyou so much - we hope to stay again!